A healthy way to prepare bacon. 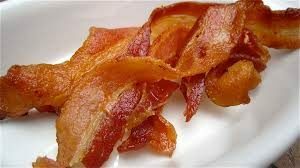 a quick guide on how to make bacon in an air fryer. Using the air fryer lets the bacon cook in it’s own fat, and any excess drips away through the basket. The air fry IS the best way to cook bacon in our opinion, coming out crispy and juicy. Only one ingredient. It would be nice if this page would also list info on preparing the frozen french fries that are available and more likely to be used by consumers.